My son's homework for the long weekend was this sheet which had the picture of a plate marked out into partitions. He was supposed to fill out what he ate for thanksgiving feast. Our thanksgiving dinner was at a Chinese restaurant, with friends of course, though I am sure that filling out the restaurant menu was not what the teacher had in mind! Well, the saving grace is that I did cook lunch for the family in the morning, so what if the family is just the three of us - kiddo, hubby & me! And I did bake something, so what if it was neither turkey nor tofurkey! "The true essentials of a feast are only fun and feed." 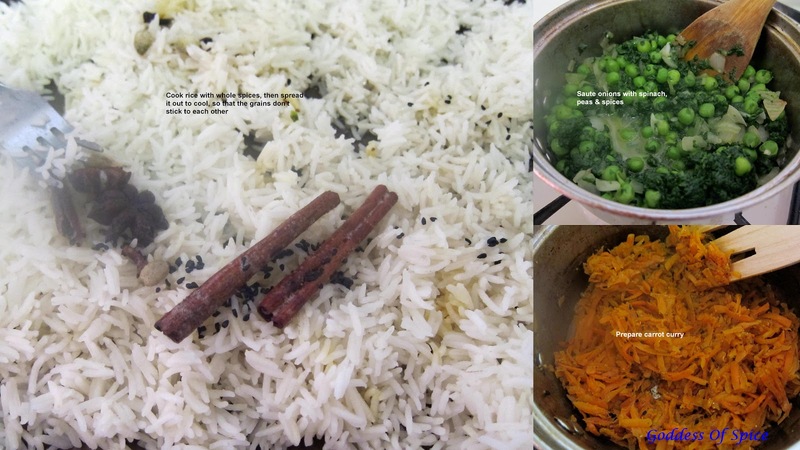 Cook the basmati rice with the whole spices, salt and ghee. I microwaved it, took about 10 minutes. Spread it on a tray to cook so that the grains don't stick to each other. Cook the grated carrots in the microwave for about 5 minutes. In another pan, heat oil and add the remaining cumin seeds. When they crackle, add the grated carrots, salt, sambar powder and turmeric powder. Cook for a minute and switch off the gas. Grease an oven proof dish. First cover the bottom with a layer of rice. Next spread a layer of spinach and peas. Once again layer the rice on top of the spinach and peas. Finally spread the carrrot curry over the rice layer. Top this off with freshly grated Parmesan cheese. Bake in preheated oven at 450 degrees for 15 minutes. 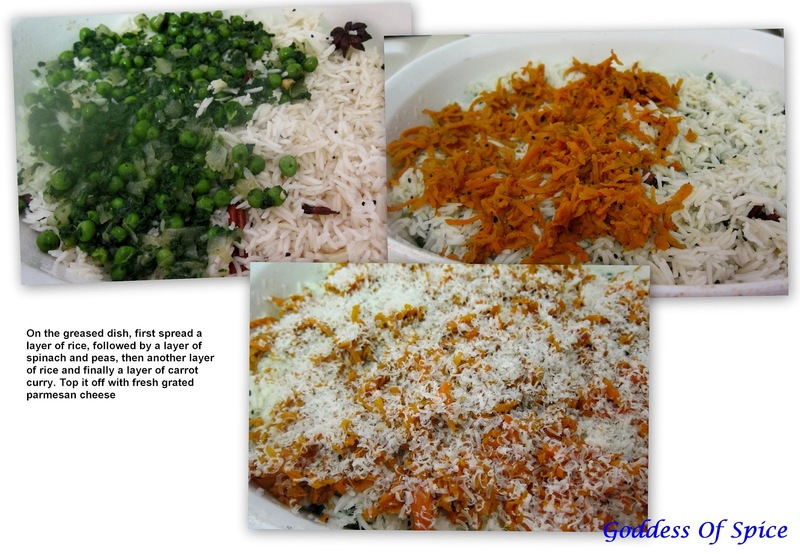 Nutritious, colorful layered rice is ready. Just before the euphoria of Deepawali, we were hit by hurricane Sandy, causing major devastation along the east coast. Our area was pretty badly hit too. We live a couple of blocks from the waterfront of the Hudson river, right across NYC. Once the water started rising, the streets started flooding at an alarming rate. Within a matter of minutes, the streets in front of our buildings were flooded and street parked cars were submerged. Within moments, most of the area lost power. It was disconcerting - you have to live in or across NYC to experience that sudden loss of electricity when the whole city is plunged into darkness, and all you can see in the darkness, is this monstrous rush of water! Don't get me wrong, growing up in the NCR region of India, I have seen my fair share of power cuts. But somehow, experiencing this in the city that never sleeps was something else entirely! The winds were howling like crazy and the building swayed a bit! We even saw a few swift boats from our window! By God's grace, things quickly got back to normal,or as close to normal as can be expected under the circumstances. Finally the adults are at work and the kids are in school, the stores are stocked and the gas stations don't have lines snaking around the block! I used left over mini idlis. By all means make fresh ones if you don't have left overs :). 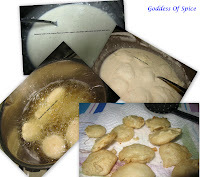 Also, if using regular idlis instead of the mini ones, just cut each one into 4-5 pieces. Prepare a batter of slightly thick consistency using all purpose flour, corn flour, pepper, salt, 1 teaspoon green chilli paste, 1 teaspoon siracha sauce, 1 teaspoon ginger garlic paste and a little water. Dip the idlis in this batter and deep fry them till they turn golden in color, remove with slotted spoon and set aside on absorbent paper. Saute the white part of the scallions along with the ginger garlic paste in the sesame oil. When the onions turn golden brown, add the remaining sauces, a little water, sugar and a little bit of salt. Be careful while adding salt as soy sauce is already added to it. Once the gravy thickens, switch off the flame and add the fried idlis to it. Garnish with the green part of scallions. Yummy idli manchurians are ready. You could eat them as an appetizer, or increase the gravy and eat it with some hakka noodles or rice. Last year for Diwali I had made this milk chocolate double layer barfi, the recipe for which I got from "Show Me The Curry". It was a big hit. Everyone loved it. Infact, I had sent out some sweets and savories to the teachers at my kid's school and they liked it so much that they requested me to get them some more of the same! So, this year I was leaning towards making the same sweet again. Then I hit a snag. The original recipe calls for the use of heavy cream. It was 2'o clock at night and I was out of heavy cream. The next day was Diwali - it was too late to go to the store and it was also too late to start off on another track altogether. I was extremely tired and at my wits end. Then I thought, let me skip the heavy cream altogether along with the sugar. I replaced these two ingredients with condensed milk. Now that I had started giving the dish my own twist, I thought, why not go the whole nine yards. I replaced the chocolate chips with mint chocolate chips. I also added some vanilla essence to the plain layer of the fudge. The end result was a refreshingly different sweet dish. Grease a rectangular tray/container in which you would like to set the sweet. 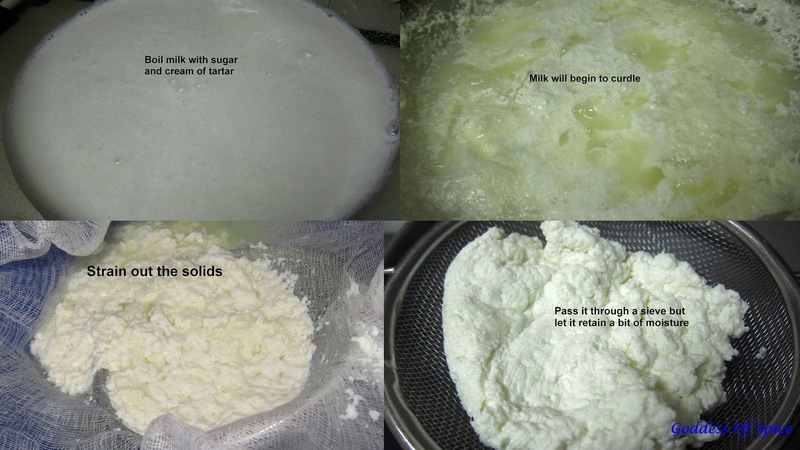 Take the condensed milk, nonfat milk powder, unsalted butter and vanilla essence in a microwave safe deep dish bowl. Microwave it for 8 minutes, stopping and stirring after every couple of minutes. Spread out half of this mixture on the greased tray and make it smooth. In the remaining half of the mixture added the cocoa powder and the mint chocolate chips. Microwave it for another 5 minutes, stopping and stirring after every two minutes. By now the plain Vanilla layer would have cooled and become a bit firm to touch. Pour in the chocolate mix on top of the vanilla layer, make a smooth layer and let it set for 3-4 hours. Once the fudge has set properly, cut out into diamonds or squares. A simple yet delicious dessert that is ready in a jiffy. Happy Deepawali! 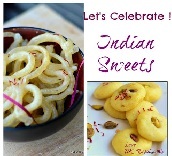 We just bid goodbye to the festival of lights and what better post to publish than a sweet recipe! I love this festival. And I happen to be among the few people who DON'T like bursting crackers. For me all the fun is in lighting the diyas and candles and also hogging the munchies. I don't mind sparklers, flowerpots and zameen chakkars - but that is the extent of enthusiasm towards fireworks that I can bring myself to show. Even as a kid, while my sister and cousins would be bursting crackers and rockets, I would just watch from a distance. Deepavali literally means "row of lights". This festival finds its roots in Ramayana. Deepavali is celebrated to mark the occasion of the return of Lord Rama, his brother Lakshman and wife Sita to Ayodhya after 14 years of vanvaas (exile). It also signifies the victory of good over evil as Lord Rama, with the aid of the Vanarasena (army of monkeys), defeated Ravana and saved his wife Sita. For us Tam Brams, Diwali starts with the "Ganga Snanam". We wake up before day break, apply sesame oil heated with some peppercorns and rice and take a bath. We wear new clothes and then starts the bursting of crackers! Oh, how can I forget the "Diwali marundu/leighiyam"? As kids, me and my sister used to absolutely abhor this weird tasting concoction that you are supposed to eat to cleanse out the stomach and avoid indigestion, considering the amount of sweets and savories that are consumed during the occasion! As an adult, I am more than happy to overlook that one tradition :), so I don't make it! Another tradition is to distribute sweets, bhakshanams (savory snacks) and gifts to friends and relatives. The responsibility of distribution usually falls on the youngsters in the family. Many were the fights that me and my sister fought in order to divide the houses that each of us would go to give the stuff prepared by amma. And now I have come a full circle. Coz this is the only thing that gives a feel of Deepavali here in the US for me. As the kids go to school and offices are also open, I am more than happy to get decked up in a sari/salwar kameez and visit friends in the evening to exchange greetings and goodies! No more complaints amma! We also decorate the house with fancy multicolored light bulbs and candles and diyas. This year, apart from the lights at the window, I painted a few clay diyas that I had bought and decorated them into a rangoli form on a cardboard with acrylic colors and some sequins and beads. 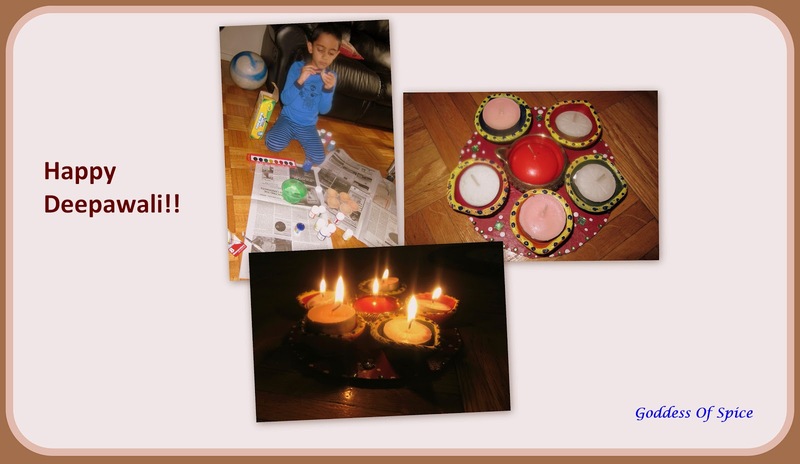 My kiddo joined my in the diya painting and we made a fun activity of it! But ofcourse I would like the first recipe to be that of a sweet. When I was in India this year, I borrowed up a couple of recipe books from my mom. This particular recipe is adapted from the Kenstar Microwave Oven Cook Book by Sanjeev Kapoor. But ofcourse I had to put my own spin on a simple Kalakand! The end result was this yummy moist sweet that looked like Kalakand but tasted more like Sandesh! Coarsely powder the almonds and pistachios and set aside, this will be the garnish. Microwave the milk for 10 minutes in a deep dish. Add the sugar and cream of tartar and put it back in the microwave for another 10 minutes. The milk will slowly curdle. Depending on the microwave, you might need a few minutes less or more. Keep an eye on the milk and it will be ready when the milk curdles forming a variety of cottage cheese known as chenna, leaving a watery liquid behind. Strain this chenna through a muslin cloth then pass it through a sieve. The original Kalakand recipe required that most if the the moisture be removed, but I let the chenna be a little moist. Mix this with the cornstarch, cardamom powder, saffron strands, almond powder, saffron essence and rose water and microwave it for another 4 minutes, stirring in between after about 2 minutes. At this stage, you could mix in the food color if you choose to use it. Now, spread this out on greased plate, garnish it with the coarsely powdered almonds and pistachios and allow it to cool and set for about a couple of hours. After the mixture has set and cooled, cut it into square/diamonds using a greased butter knife. Dig in, distribute and spread the joy!